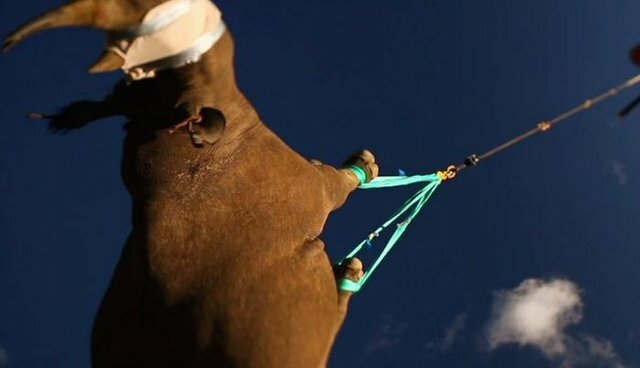 A rhino whizzing through the clear blue sky seems like a whimsy cartoon, but rhino relocation is no joke. Underlying these drastic measures is the real and relentless slaughter of the endangered species. In the latest, largest-ever rhino relocation, Rhinos Without Borders is moving 100 of the massive animals from South Africa to Botswana, where they will be somewhat safer from rampant rhino poaching, up 9,000 percent since 2007. Previous rhino flights include those sponsored by WWF's Black Rhino Expansion Project, which relocates rhinos from one part of South Africa to another safer region of the country. Below are scenes from WWF'S 2011 flight. If they have to travel, rhinos really prefer to power-walk. But to escape dreadful poachers, some rhinos simply have to fly. At last! By takeoff, this rhino's sedative finally kicked in. This rhino thinks maybe he should have sprung for business class. You can help a rhino catch a direct flight here.